This herbed vegetable rice entree is a one-pot-wonder, including the carbohydrates, vegetables, and protein with the flavours of fresh herbs for a complete meal. Sage is an outstanding memory enhancer. It also has antioxidant and anti-inflammatory properties. Sage has dietary fiber, vitamin A (carotenoid), calcium, and iron. Sage can be found fresh, dried, or ground and is a great addition to stuffing’s and warmer dishes. Wash, rinse brown rice and soak for 30 minutes. After soaking time drain. Now bring water/vegetable broth to boil in a saucepan add soaked- drained rice and cook on a medium-high flame for 20 minutes or until rice is cooked. Heat oil in the pan; Add garlic, onions and sauté for 2-3 minutes. Then add carrot, potato, beans and sauté for 8-10 minutes/ until potatoes and carrots are tender. Now add peas, jalapeno pepper, sage, basil and sauté for 4-5 minutes/ until the flavour of greens blended in. Sprinkle salt, garlic powder, paprika, cooked brown rice and sauté a final 5 minutes and turn the heat off. Garnish with herbs and Serve with any curry/side dish. 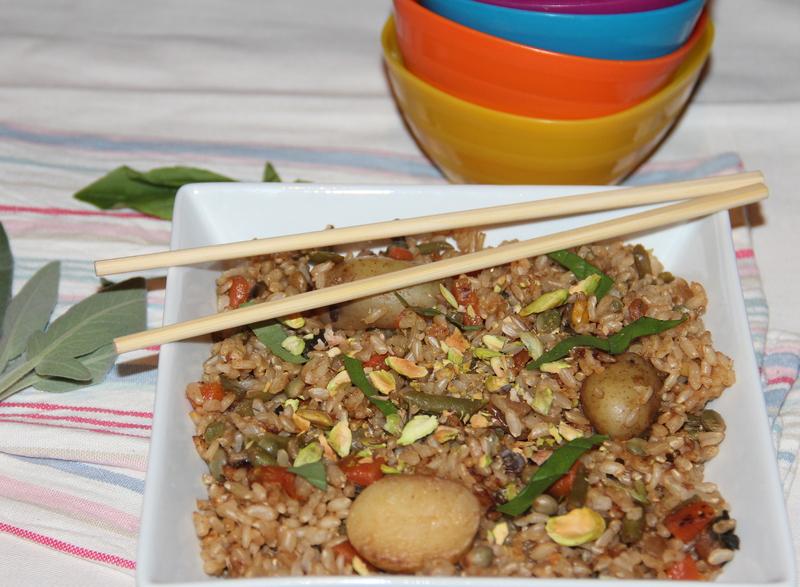 Alternatively white rice/bulgur or any rice can be used. Spices, herbs and vegetables can be personalised as per the taste. Posted on December 21, 2014, in Indian, Main dish. Bookmark the permalink. 16 Comments. Chitra this is delicious, reminds me a little of Thai Basil rice which I love. Wonderful combination of vegetables and herbs. Glad to know about Thai Basil rice…It’s nice to know so many new cuisines and dishes thru you Suzanne.. Thank you Cindy. … have a fabulous Sunday. ..
Looks really tempting – I love one pot dishes! I love one pot meals. The flavour that herbs lend food is amazing,na?